New phishing e-mails have surfaced which claim to come from [email protected] – it could be that you’re being targeted in an attack designed to steal your AOL, Gmail, Yahoo or Windows Live password. At first sight, if you don’t look too cautiously, the emails entitled “Microsoft Windows Update” may seem harmless enough. But the grammatical errors and casual odd language should bring up alarm bells that the emails may not really be from Microsoft. 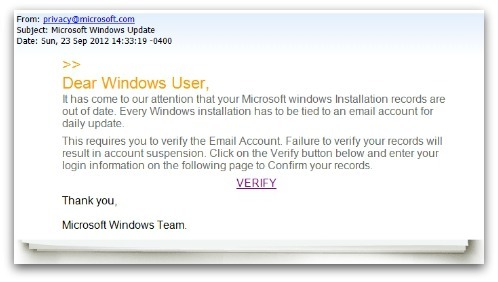 When the link contained in the e-mail is clicked it will bring you to a Microsoft.com phishing site. You’re then warned that your computer is insecure and directed to choose to login via Windows Live, AOL, Gmail or Yahoo. 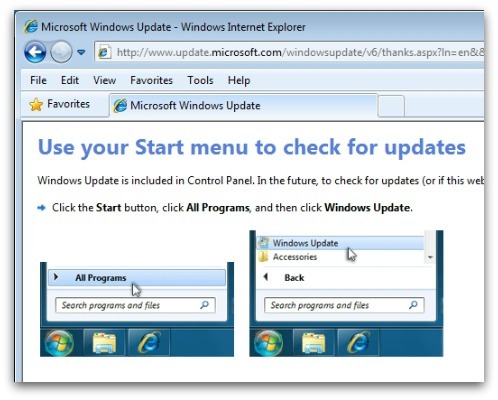 Sophos, who posted an analysis on this phishing scam had said that once your information is submited it will redirect the user to a tutorial on how to update your Windows PC on the real Microsoft.com website.